Fewer people are going back to prison in the US, a welcome statistic for the nation that locks up more of its population than any other – but what’s behind the change? Investment in rehabilitation has led to measurable success, according to analysis from The Pew Charitable Trusts. The research shows the share of those returning to state prison three years after being released – a common measure of recidivism – slid by nearly a quarter over a seven-year period, and longer-term rates of reincarceration also dropped. The changes come alongside what the Council of State Governments Justice Center has called a “seismic shift” in mindset away from prioritizing punishment, toward programs for rehabilitation. In 2008, Congress passed the Second Chance Act, to offer grants supporting services like employment, training and assistance, substance use treatment, education, housing, family programming and mentoring. There is striking evidence that policies to lower recidivism work. 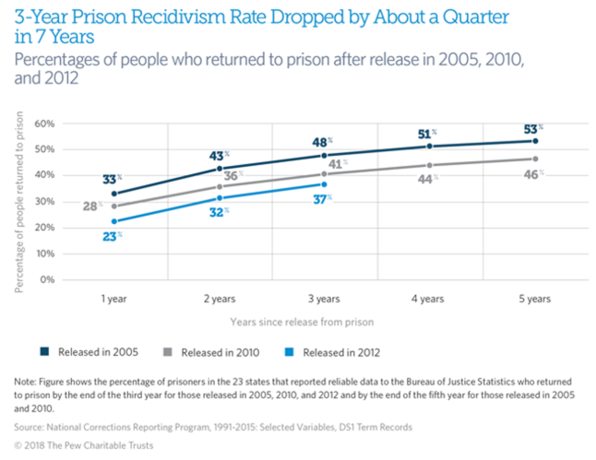 Pew also analyzed more recent state-level data to show significant reductions in return to prison from parole. For example, Georgia cut its rate by 35% between 2007 and 2016, and Michigan's fell by 43% between 2006 and 2015. Education and vocational training play a key role and have also been shown to generate a return on investment. Prisoners in New York who achieve a college degree while incarcerated are almost half as likely to get arrested after release compared to inmates who do not. Separate research showed Minnesota prisoners who participate in work-release programs are 17% less likely to be sent back to prison. Substance abuse treatment offers another pillar. A study involving inmates in the Delaware Correctional System used a work-release program with drug-free residential settings, continuous monitoring by counselors, group therapy and family sessions. It showed a higher percentage of inmates who had participated in the program were drug- and arrest-free than those assigned to the usual work-release program. Other methods that can improve recidivism rates include drug courts, improving mental health and programs that specifically work with juvenile offenders. A side benefit of all these efforts is a reduction in costs. According to the US Bureau of Prisons, the average cost of incarceration for one inmate in 2017 was $36,300, or almost $100 per day. 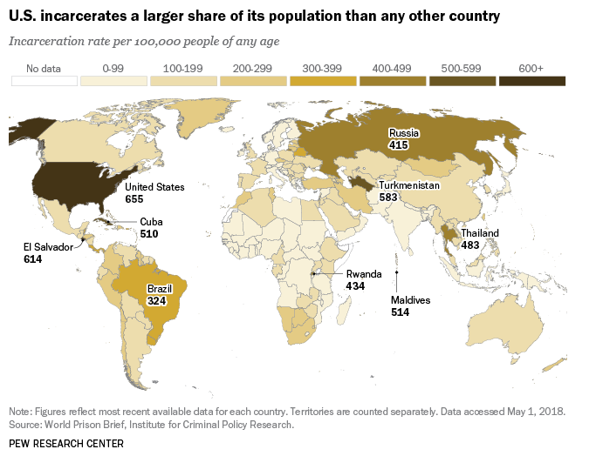 Even so, while the US incarceration rate has fallen to the lowest level in 20 years, the nation still locks up a greater proportion of its population than any other country.